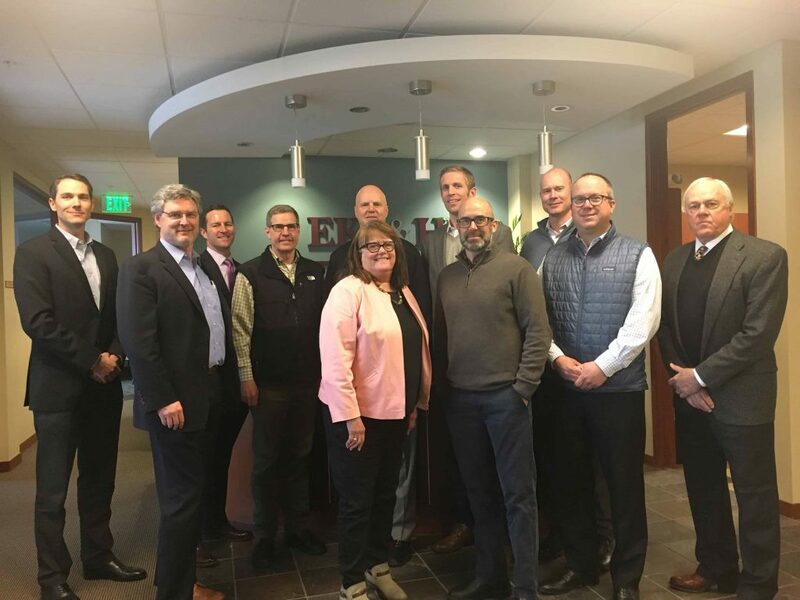 BOULDER — Boulder’s industry leaders gathered at BizWest’s CEO Roundtable Tuesday to discuss the economy and economic development along the Front Range. Across the board, major Boulder industries have benefited from significant growth. “We’re nearing our record economic expansion,” said Brian Lewandowski, associate director for the Business Research Division and senior associate dean for the Leeds School of Business at the University of Colorado Boulder. While growth will likely slow down in 2019 and 2020, Lewandowski said he would be hard-pressed to see a recession in 2019. That being said, the analogy he used is college football: If you take a look at preseason ranking in August, there were a number of teams on the list that ended up not being on the list at the end of the year. Looking three months or six months out or 12 months out from the last recession, the economy looked pretty healthy. “So my point is, things can change,” he said. Lewandowski did say he had some concerns: trade, slower growth, interest rates. All of that stems from uncertainty, which can come from federal policies and signals from Washington. When it comes to Colorado, however, he’s optimistic. Kyle Heckman, CEO of Flatirons Bank, said he’s seeing the benefits Colorado is enjoying reflected in the customers with whom he works. Another market that is seeing growth — although that growth can come with a double-edged sword — is housing and real estate. One adjustment that needs to be made due to Boulder’s gangbuster growth is a lack of inventory. Gullette said that low inventory should be accepted as the new normal. Boulder also has a high number of rentals. Boulder is over 50 percent rented. In fact, said Gullette, it’s safe to assume that on every street there is likely a house being rented. Additionally, attached dwellings are seeing high demand, and developers are responding by moving from building single-family housing to multi-family housing. Perhaps one of the most drastic changes that has come with Boulder’s boom is the increase in real estate prices. In the city of Boulder, the average home price is up to $1.2 million and the median price is up to $955,000. The number of days on the market, a sign of how quickly things are moving, is down to 57 days for Boulder. That figure is down 11 percent from 2017 and is about half the days on the market for a home sold in 2012. While real estate seems to be growing, the health-care industry is focusing on efficiency. He added that employers are getting tired of double-digit health-care costs and are putting pressure on payers, and payers are putting the pressure on health-care systems to drive down their reimbursement. Hinchey said that over the years, Boulder Community Health has seen an increase in competition. To counterbalance that competition, the health-care system has leaned into its community relationships. Another industry looking toward innovation to keep up with growth is higher education, as seen through what the University of Colorado Boulder is doing. Draper said one way CU Boulder is innovating is by looking at the student population in the future and how it can best be served. Student bases are changing, as evidenced through the rise of massive online entities being heavily advertised. She said the university is also trying new experiments, such as a master’s of science for electrical engineering, where there is no prequalifying element: students can start taking the class and as they pass move onto the next step. If they go all the way, they are able to earn their master’s degree. As the Boulder economy grows, so too has Boulder’s attraction to tourists both for leisure and business. Because of this, Mahoney said her team is targeting high-value travelers, especially those in groups. Mahoney said as long as the economy stays strong, she expects travel to reflect that. “When consumer confidence is there, business travelers continue to travel, and families plan their family vacations because they’ve earned it,” she said. DIA is the fifth-busiest airport in the country, she added, and that’s bolstered by the availability of affordable airlines to Denver. People visiting friends and family is a high market for Colorado. In Boulder, it makes up 43 percent of visitors. Day visitors is also a strong travel market: About 4 million day visitors come to Boulder. And Boulder captures visitors from other cities as well: Of the people who visit Denver as overnight guests, about 16 percent of those visitors come to visit Boulder while staying in Denver. Another sector reflecting Boulder’s strong economy is the real estate investment sector. He said that cap rates are stable and low, and he doesn’t expect that to change. Interest rates could put upward pressure on cap rates, but Barto said he didn’t expect that to quell any enthusiasm for markets in the area. Barto also acknowledged that Boulder wasn’t the only Boulder County city seeing an upward trend. Boulder’s economic development had a major year in 2018, said Clif Harald, executive director of the Boulder Economic Council. But serial acquisition can have its downsides. Companies such as Boulder Brands was swept up in it. AstraZeneca closed. Still, Harald said he was hopeful a new company could come in and fill the spaces. AstraZeneca made significant improvements to the buildings it’s now leaving in Boulder and Longmont that could be attractive to a new biologics manufacturer. Beyond these examples, Harald said niche Boulder industries such as natural-foods production and biotech are seeing success. He added that while some employees get laid off as major companies decide to leave Boulder, there’s an opportunity to reabsorb that talent and keep it in the region through the rise of new successful startups. The Boulder CEO Roundtable on the Economy included: Hunter Barto, senior associate at Dean Callan & Co.; Frances Draper, vice chancellor for strategic relations, University of Colorado Boulder; Todd Gullette, managing broker at Re/Max of Boulder; Clif Harald, executive director of the Boulder Economic Council; Kyle Heckman, CEO of Flatirons Bank; Paul Hinchey, chief strategy officer for Boulder Community Health; Brian Lewandowski, associate director of the Business Research Division and senior associate dean of the Leeds School of Business at University of Colorado Boulder; and Maryann Mahoney, CEO of the Boulder Convention & Visitors Bureau. Moderated by BizWest editor/ publisher Christopher Wood. Sponsored by EKS&H, now part of Plante Moran (represented by Jim Cowgill and Jeremy Wilson) and Berg Hill Greenleaf and Ruscitti (represented by George Berg and Peter Schaub).